Yikes! These last few weeks have been absolutely CRAZY! I never felt like I completely recovered from our Fourth of July trip. I had a colonoscopy last week, and I just finished throwing the hubs a birthday bash today--#30! Next week, we're leaving town for my best friend's wedding! I know many of you have echoed your own feelings of summer craziness in your posts, so you understand! 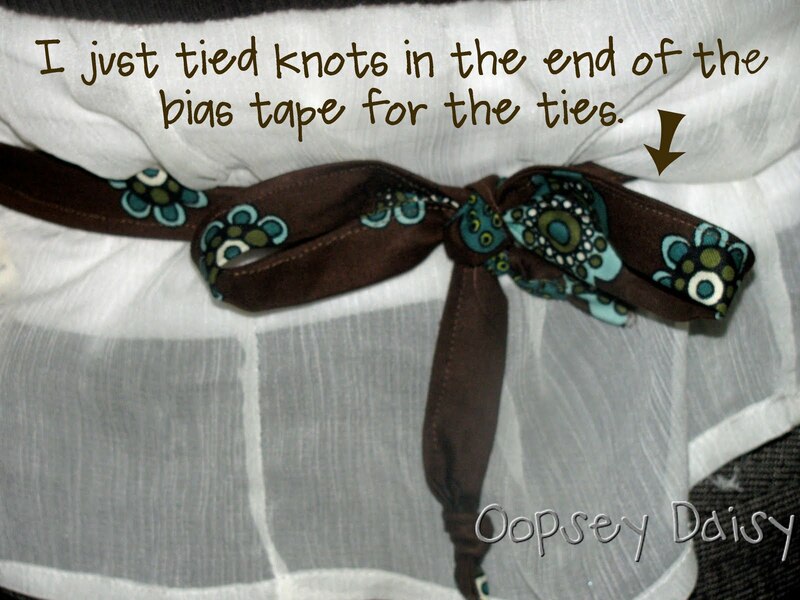 But I missed my Wednesday's Wowzers yesterday, so I will stockpile my favorite ideas for next week! Someday I will start some fresh new craft ideas, but in the mean time, thank goodness I have some projects in my photo archives that I haven't shared yet! Here is one of them. Do I look super domestic in these pictures or what?! 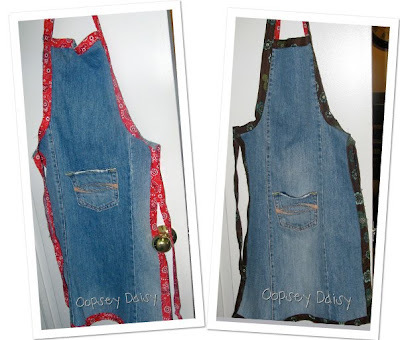 Can you believe that these are my first-ever aprons?! I don't know how I survived cooking up until now without one!! No more annoying splatters. And even my Sunday-best is protected. My Little Man is an excellent kitchen helper! 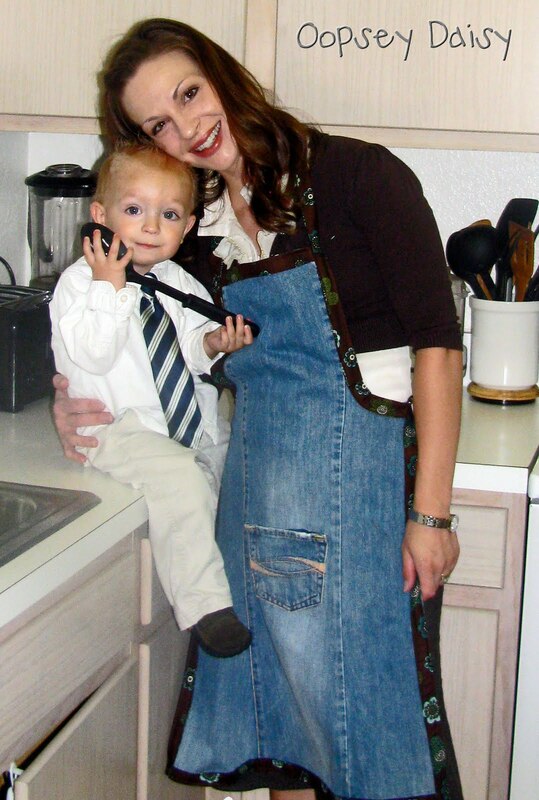 Whenever I am cooking in my tiny kitchen, he always requests a spoon and a measuring cup or bowl to mix up some yumminess of his own! 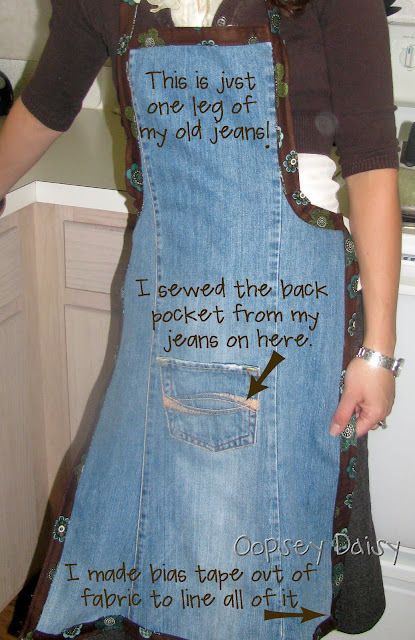 I may have to make him his own denim apron out of an old pair of his jeans! So my friends... which apron is your favorite? 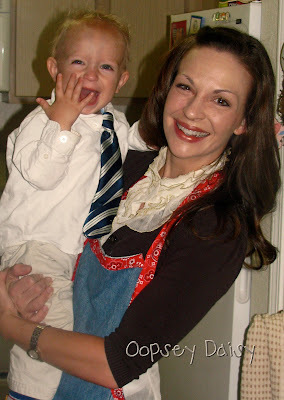 The red bandana apron or brown flower apron?! I love both depending on my outfit, of course! Cute! I'm partial to the red. Denim and red bandana are just a match made in heaven! Very creative and a great use of old jeans! They are both adorable! Thanks for linking @Creative Itch's "Sew Cute Tuesday"! Of course you must ensure that your apron and your outfit coordinate. I'm a sucker for anything bandana-ish, so I'd have to vote for the red trimmed apron as my favorite. You did a great job! Wow! Love it! You are truly amazing!! Those turned out great! 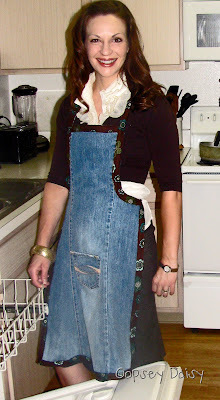 I love aprons! You did a great job!!! I love these so much, the brown fabric it just awesome! !